Bishop of Bath & Wells Rt Revd Peter Hancock has been invited to take part in BBC Radio 2’s Pause for Thought as part of their week of live broadcasting from Glastonbury Festival. The longstanding item features on the breakfast show and is an opportunity for faith leaders to share a moment of reflection with the nation. Bishop Peter will broadcast his two minute reflection on Friday 27 June. Afterwards the Bishop will meet with festival founder, Michael Eavis and take a tour of the festival grounds. The announcement comes two weeks after the Bishop formally took up the role of Bishop of Bath & Wells. Over 1000 people witnessed his installation as part of a service of welcome at Wells Cathedral. Last year Archdeacon Andy Piggott was invited to take part in Pause for Thought. He had the task of delivering his two-minute reflection immediately after a live performance by the guitarist Jake Bugg. 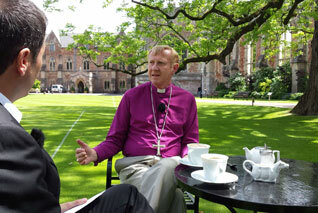 You can listen to Bishop Peter Hancock on Pause for Thought on Friday 27 at 9.20am on BBC Radio 2. Listen to Archdeacon Andy Piggott’s, Pause for Thought from Glastonbury 2013.